Birthday wishes for ex-wife: It is a tricky task to wish your ex-wife Happy Birthday because your message can be interpreted in a lot of different ways. Depending on the situation of your divorce, children and how you both have moved on, write something sweet on a greeting card or on her Facebook to show that you still respect the fact that you were once married. Take ideas from these heartfelt wishes, funny quotes and cute messages to play your part as the supportive ex-husband. If not for yourself do it to set an example for your lovely kids. Show them that no matter how bitterly a marriage falls apart, a husband and wife can still remain amicable friends for the sake of their children. 1) There was a time when we both wanted to spend our lives together, followed by a time when we could stand each other. There was a time when each other’s happiness we couldn’t see, but now we have realized that we just weren’t meant to be. Happy birthday to my ex. 2) I will not lie, I will admit. Yes I am still sad, about the way we split. 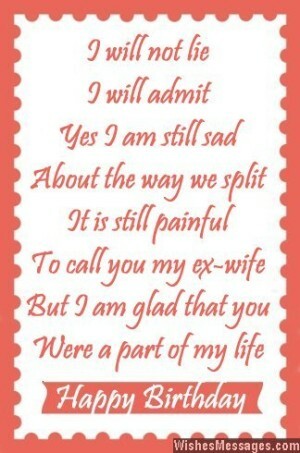 It is still painful, to call you my ex-wife. But I am still glad, that you were a part of my life. Happy birthday. 3) Love was the reason for our marriage. Hate was the reason for our divorce. Let’s forget all those reasons and let a smile be the reason for our friendship. Happy birthday to my ex. 4) Our marriage broke apart but we never behaved like nasty exes and enemies. I am glad that we have done justice to our memories. Happy birthday. 5) I would be lying if I said that I didn’t have any regrets, but I also know a wise quote which says – suffers, he who does not forget. Happy birthday dear. 6) Our divorce has caged us both in a prison of bitter memories. Your birthday seems like the perfect day to break free from the shackles of our past and look towards an amicable future. Happy birthday. 7) Exes are supposed to be mean, rude and nasty. We are not like that, because we respect the fact that we were once family. Happy birthday to my ex-wife. 8) I get angry when I think that you are partly responsible for our divorce and all other worries. But I calm down when I realize that you are also partly responsible for our adorable children and beautiful memories. Happy birthday to my ex. 9) When we started dating, I never thought I would call you my ex-wife. Call it luck or call it destiny, such is life. Happy birthday. 10) Even after the bitter divorce, I want my ex-wife to be happy. I am not mad, nor am I crazy. At the end of the day, she was my family. Happy birthday. 11) I have decided to have a selective memory for our past. I have conveniently forgotten the bitter battles of our divorce and remember only the sweet memories of our honeymoon. Happy birthday to my ex. 12) Our relationship ended when we got married. Our marriage ended when we got divorced. On your birthday, I hope that whatever happens, our friendship never ends. Happy birthday to my ex-wife. 13) No matter how we move on and who we move on with, our marriage will always be a unique relationship that will define our future. Happy birthday dear. 14) The last few years were tough, our divorce was rough. But I want to put that behind, because I have our kinds in mind. Happy birthday. 15) Our marriage gave us love and happiness. Our divorce gave us pain and bitterness. On your birthday, I wish that we both grow out of this mess. Happy birthday. 16) Let’s not see our divorce as a failed marriage between you and me, but a relationship that just wasn’t there in our destiny. Happy birthday. 17) I am your ex-husband and you are my ex-wife, we will never be able to change that fact. But to miss wishing you on your birthday, is not the way I want to act. Happy birthday. 18) I am jealous at looking how easily you have moved on with your life, but that doesn’t make me stop wishing you on your birthday because you are still my ex-wife. Happy birthday dear. 19) Let’s not dismiss our marriage as a dark spot, let’s embrace it as a warm thought. On that wonderful note, I want to wish you on your birthday with this quote. Happy birthday. 20) As exes, we may have fought with each other like monsters. But as parents, we have come together when it matters. Happy birthday to my ex. 21) One of my friends asked me if I would get married again even after my first marriage fell apart. I said yes, because even though me and my ex-wife went different ways, we fondly remember our golden days. Happy birthday. 22) It’s been a long time since we’ve met, but your birthday I will never forget. Happy birthday. 23) I am glad we patched up our bleeding divorce with the bandage of friendship so that we can support each other to give our kids the good upbringing that they deserve. Happy birthday. 24) Even though we don’t share our lives with each other anymore, I wish you happiness in yours. Happy birthday. 25) Our marriage is over, but our lives aren’t. We could make our past work, but at least we didn’t become nasty jerks. Happy birthday. 26) If we can manage to fall in love, get married and then break each others’ heart, I am sure that for the sake of our children, we can move on independently with a fresh start. Happy birthday. 27) Sometimes, things just don’t work out between a husband and his wife. But every time, they still have the chance to remain friends for life. Happy birthday. 28) You could have taken all my money when you left, but you chose not to. For that, I will forever be grateful to you. Happy birthday. 29) If I had the power to turn back time, I would change a lot of things except one – the fact that my children have a loving mother like you. Happy birthday. 30) We will never be a couple again, and the memories of our divorce will also bring pain. But despite the bitter past you are still the mother of my children, and I hope that your birthday is happy and fun. Have a good one.